The English companion of this blog (kamangir.net) has been inactive in the past few months, partially due to technical difficulties and more importantly because I have been here, writing in Persian. That said, the situation is dire. 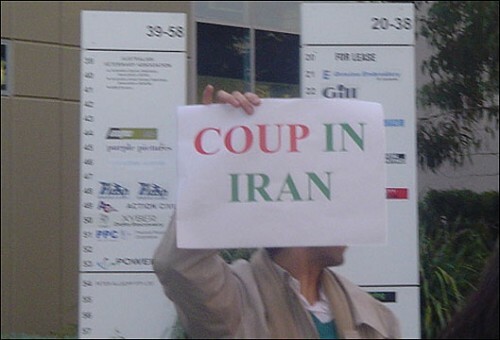 What many people tend to call a political coup has happened and there are protests in many cities all around Iran. We need media attention. We need the pictures of the protests and the videos to be seen. A lot of the Iranians I have talked to believe that Ahmadinejad has abused the elections, a tool of democracy, for pursuing his anti-democratic agendas. The bottom line is, the published results and the arrests show alarming indications that this is not just another election. Mass peaceful protest demonstration against rigged election in Iran, Sunday Jun 13, Toronto, 2-5pm, Mel Lastman square. We are standing as one. No political factions! This is not a call to violence in any form. Picture: Protest in Australia, from BBC.